Inspiring Success Story of Naveen Tewari - "The man who personalized the Ads!" 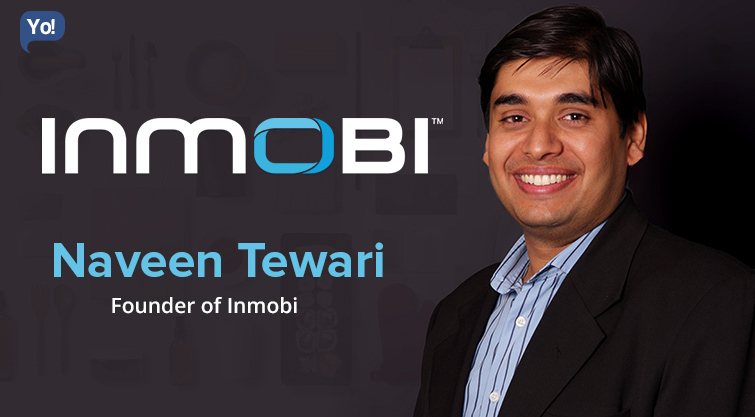 A very well-known known name amongst the business community – Naveen Tewari is the Founder of InMobi, a global mobile advertising and technology platform. InMobi is one of the very rare India-based platforms that is defining the mobile first customer-engagement through its list of products ranging from app distribution & monetization to brand advertisements. And with over 100 billion discovery sessions on mobile, more than 1 Billion monthly active users spread across 160+ Countries, and 138 Billion monthly ad impressions, InMobi holds the largest and the most dependable ad network in the world. Their client-base includes the who’s-who like Yamaha Motor Co, Microsoft, Adidas, Lancome, etc. The 30-something year old married Naveen, is also the father of two beautiful children (Daughter and Son). And despite owning a Billion-dollar company, the founder certainly does not act as a cocky multimillionaire but instead, still drives a Honda City and flies Economy Class. Talking about his qualifications; the highly qualified Naveen has completed his Masters in Business Administration from the Harvard Business School and before that he had also earned his Mechanical Engineering Degree from the prestigious Indian Institute of Technology, Kanpur. The Life As A Common Man! Belonging to a family (Father and Grandmother) of IIT Professors at Kanpur, it was a given that he too had to pursue his Bachelor’s degree from there. Soon after completing his Mechanical Engineering, Naveen began his career and joined McKinsey & Company in 2000. Apart from working with the top management of technology companies on various issues; one of his primary tasks was also to develop Go-to-market strategies for a large Indian corporation. After working with them for around 3 years, Naveen moved to the Harvard Business School, to pursue his MBA in 2003. While he was at it, he also joined one of the top VC froms called Charles River Ventures (CRV) as an Associate. CRV was one of the very few back then, who focused on early stage investing in software and communications. His role at CRV was to develop an India Investment Strategy along with Technology investments across the US. Although, this stint of his was only of about five months, but it give him a deep understanding of the markets altogether. Quitting his job, Naveen diverted his complete focus towards his MBA and also managed to bag the Dean’s Award, for exceptional leadership and contribution. While at Harvard, Naveen had also founded (and still runs) a non-profit organization in 2005 called – “India Schoolhouse Fund”, which funds and sets up schools in rural India. He is also the Chairman of the organization. Moving on, after completing his MBA from Harvard, Naveen unlike the other commoners decided to take a different route. To begin with, for one whole year of 2006, he went into the wandering and research mode, to find the right idea or business model that he could begin (mainly around Silicon Valley). And in 2007, he founded mKhoj! Naveen Tewari – The Entrepreneur! Now as we all know, Entrepreneurs will always remain entrepreneurs, come what may! Similar was the case of our hero – Naveen. An entrepreneur-at-heart, was always fascinated to become one, and to pursue his dream, he left his well paying job and potentially successful career, and took the route of entrepreneurship. And Naveen not only successfully persuaded his cofounders (Mohit Saxena, Amit Gupta and Abhay Singhal) to leave their high paying jobs, but he also swayed several of his employees to quit their well established jobs at Google, Microsoft and Yahoo, to join his start-up. Now during his wandering and research days, he noticed that, the market was rapidly changing to mobile; more specifically to mobile internet. Hence, Naveen along with his new found team began to experiment that market, on ideas such as VOIP application, chat application, etc, but because the market back then was too adolescent for these products, they had to think of something else. They started to think of other possible options they had – these fundamental services ranged from mobile e-payments to advertising platforms. And it clicked! With a strong inclination towards the advertising side of the business, they got what they needed. And in 2007, from a shared apartment in Mumbai – mKhoj came into being! Trivia: They used to be called as the – ‘Boys with powerpoint’. The company that had started with an Angel Funding of $500,000 from Mumbai Angels was an SMS-based search platform. But this new idea of theirs, sadly tanked in a while too! Well to begin with; Mobile-based search was an ahead way ahead of its times, and the market was clearly not ready for it. So even after much efforts, the idea wasn’t able to crawl, let alone flying. And much like other local search companies like Guruji and AskLaila, they too found it highly difficult to survive as well. Hence, without wasting much time, they tweaked their business model to mobile-based deals focusing only on Mumbai and called it – mKhoj Version 2.0. Much like their Version 1.0, the second version too faced immense difficulties. Even though they were able to source in 3000 Stores across Greater Mumbai, but then too there were huge problems they had to face like sending 50 agents to over 18,000 different stores to sign them up, or agents running away with the money, etc. A desperate need for a new idea was arising. After a lot of heated and anxious discussions between the partners, it was decided that they would be giving mobile advertising a try. This was their Version 3.0. But since they had begun to gain some traction from the Deals segment, they decided to opt for the safer route, and began Mobile Advertising from two rented servers in Mumbai, along with the deals business. The company was facing a huge crunch of capital and morale, and the product had still not hit the market, so they had no paying customers. And looking at the stage they were at, evidently no investor would also invest as well. So they had to work without taking home their personal salaries, and the founders additionally also had pitched in with their credit cards, to manage their expenses as well. Now all of this sounds very easy to hear, but these were extremely difficult times for all the founders, to whom, the future of their first venture looked highly uncertain. Once the product was ready, Naveen began meeting several venture capital firms, to raise funds. Most of these shot him down, sometimes after long presentations as well. But the turning point came when a meeting with Ajit Nazra of Kleiner Perkins Caufield & Byers, and Ram Shriram of Sherpalo Investments took place. This changed their whole life. And believe it or not, within just half an hour of a meeting, Naveen walked out with a deal for an investment of $8 million. And thus began the upward trend! Now that they had received funding; unlike earlier, the company now faced a different set of challenges. To strengthen their base, the company now had to shift their focus to putting together a great team and increase their present 8 member team (in 2008) to a number which best matched the soon-to-be-big start-up, to take it to the next level. In less than six months, the company moved their base to Bangalore, by the end of the year, over 50 people in 4 offices across the globe had joined the company, and around May-June of 2009, their growth had crossed far beyond anyone’s expectations to become a 75+ member company with 4 offices in the world. And by 2011, with over 100,000 publishers and advertisers in 205 countries, the company had clearly grown massively. They now had 16 offices across the world and were now termed as one of the fastest growing mobile advertising networks globally! To appeal to the international audience better, the company was later rebranded in 2012 to InMobi. And with that, they also changed their complete focus towards mobile advertising. Now initially, the company used to depend on mobile web published content to generate revenue through Mobile Value Added Services via Mobile Phone Networks billing. So basically, they were like Google who acted as mediators for display of ads between the Advertiser and the Publisher. So how was InMobi different from other Ad networks? Here, this game is of numbers (in a different way). The one, who has more advertisers and publishers on their platform, wins. And looking at their network, they were the clear winners. And how did InMobi make money? Well, the company used to charge a cut of 30 to 40% on payments for ads that they help display on mobile websites. InMobi launched the “InMobi Ad Tracker” (IAT), which was a mobile conversion tracking platform for its advertisers, which provided real-time analytics, which leveraged the advertisers on-board to evaluate and keep a check of multiple conversions on both mobile web and app campaigns, across all advertising networks and publishers. Additionally, the company also released a Version 2.0 of the tracker incorporating global device recognition from AdTruth as well. Later in the same year, “InMobi Lifetime Value Platform” was also released for its publishers and app developers, to help them track metrics and at the same time, also send messages that are based on the consumer behaviour and profile. Due to such and many more like these developments, by 2013; InMobi had expanded to become a global brand with offices in countries like Australia, Taiwan, the USA, the UK, France, Italy, Russia, Germany, China and many more. And as a matter of fact, even after launching in China in late 2011, InMobi had become one of the largest mobile ad networks there as well. By now the company, with their army of more than a thousand large enterprise customers (including Unilever and Samsung), was clocking revenues worth $500 million. 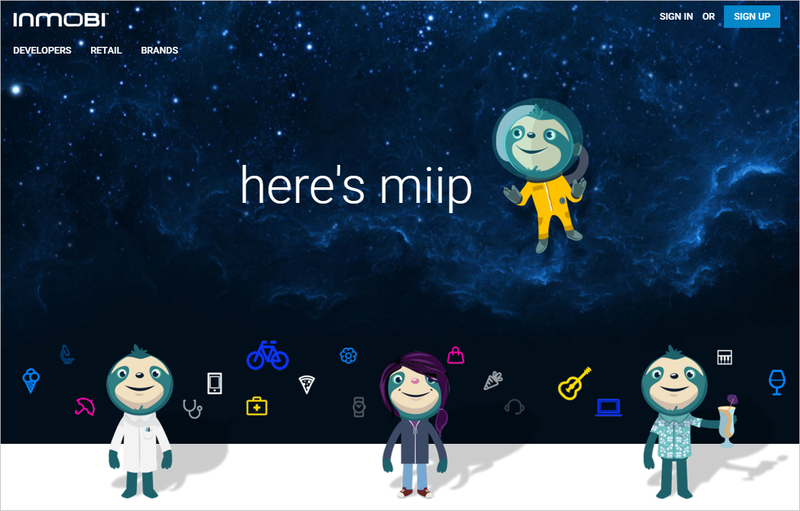 And finally & most recently in 2015, InMobi has unveiled their most awaited product – Miip. 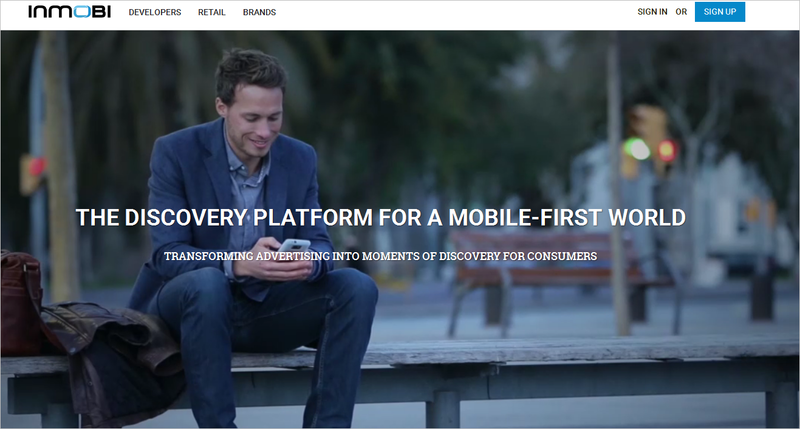 Miip is in true terms a revolutionary discovery platform that transforms advertising into moments of discovery for users. Miip is a platform that personalizes the discovery experience over time, by understanding the users through their conversations. The basic premise of Miip lies in the fact that, we all hate ads, primarily because these ads are forced on us, with literally no concern of relevance. And this only worsens more on mobile phones. Naveen believes that the Advertisements today have completely forgotten the central character of the story – ‘the user’. Hence, with their latest prodigy, they aim to put the power back into the hands of the user, by providing a more consistent, personalized and content-rich experience. So, if you are viewing an article about party dresses on a fashion blog, you would find a set of party dresses from a range of retailers at the end of the article, and if there’s an audio or video attached to any of these ads then you can choose to press to hear or view those, and you can also purchase that product by paying for it. And all of this can be achieved, without leaving the app. Miip ads have begun by appearing on 40,000 apps. Since, they have scaled globally; the company with its team of 900+ members now competes directly with Google’s AdMob Millennial media and Apple’s iAd. Over the period of time, the company has also made a few acquisitions. These include – Overlay Media, Metaflow Solutions, MMTG Labs, Appstores.com and Sprout. Talking about their funding; InMobi has raised a total of $220.6M from Investors including Kleiner Perkins Caufield & Byers, Sherpalo Ventures, Polaris Partners and SoftBank Capital.